Where Do All Your Tweets Go? Do you ever wonder what happens to all those tweets you painstakingly (or not so painstakingly) tweet? I often ask myself how many people out there really see what I have to say about libraries and technology and what twitter is not telling me. Luckily, there are lots of websites and programs out there to try to answer my burning twitter questions. Here are a few that are fun to play around with. Klout gives you a “Klout Score” which is a number between 1 and 100 that measures how many people you influence, how much you influence them and how influential they are. Klout will also measure your influenced based on multiple social media accounts. Connect your Twitter, facebook and LinkedIn accounts, among others, for the most accurate score. TweetReach has an easy to use interface – enter your twitter handle to see how many people you have reached and how many “impressions” you have made. Sign up for a free account for downloadable reports or pay for a Pro account to track your tweets over time. 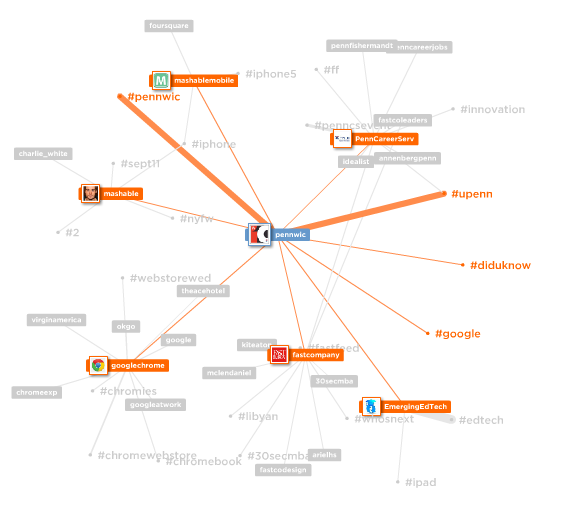 MentionMapp is a very cool visual representation of the people and hashtags you have mentioned in your recent tweets, and where your tweet goes from there. You can also zoom in and zoom out anywhere on the map. The Archivist does what you think it does. It searches an archive of tweets, whether you search by user or hashtag and shows you charts and graphs about you and your tweets based upon your tweets over time. Sign in to save your archive and change the settings to keep your archive private or make it public. The Archivist is free to use. If you are using twitter in a professional context or sharing many links, using “second chance” tweets might also help you reach your audience. According to Danny Sullivan of Search Engine Land, after three hours our tweets are headed into oblivion. I know I do not scroll through days of tweets at a time looking for links that I may have missed or after a tweet-free weekend at the beach. To combat the twitter link half-life, @searchengineland schedules a “second chance” tweet that generates 50% more traffic. That is a boost that is worth the effort.